As many of you know bison fiber is quite difficult to come by and the demand for our products has been pretty stout. We have had a bit of difficulty keeping up with production, so we have started investigating new sources of a lightweight, soft, warm, non-allergenic fiber. At an event a couple of years back, a customer came up to me and was sort of distraught that most bison are raised on ranches, and asked me "Why can't bison just live in the wild....... like squirrels" Well, that got us thinking, why couldn't we use squirrel fiber to make garments? They are plentiful, come in some beautiful natural colors, and much less dangerous than shearing a bison. Squirrel Fiber is as soft as Norweigan Rat! warmer than badger wool, hypo-allergenic and almost completely waterproof." In a world growing weary of synthetic materials and enthusiastically turning toward eco-friendly choices, squirrel fiber offers an opportunity for consumers to wear soft, warm, durable, natural garments. It’s hard to believe that wearing an item that feels so luxurious to the touch is also a fantastic choice for the earth-conscious consumer. They are plentiful, and available worldwide! 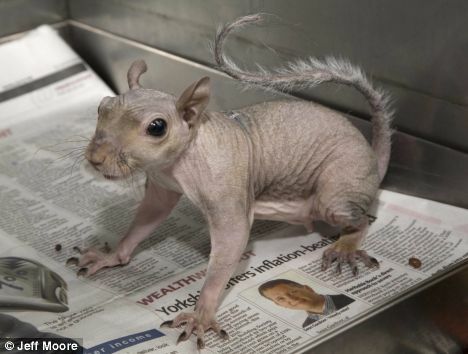 So, we wondered if it would be possible to get the fiber off a squirrel and turn it into something great. A little backyard experimentation proved to have some wonderful results! We took the fiber to our spinning mill and they have managed to make a really lofty, soft, and durable yarn. So, now we were ready to make something... and we asked ourselves "what could possibly be the best use of a lightweight, moisture wicking fiber, that has amazing insulating properties, is soft and comfortable, non-allergenic, and breathes really well?" the answer was completely obvious. SOCKS, and not just any sock. We wanted something we could wear year-round, keep our feet from sweating, and not get too hot. So, The Squirrel Wool Co. is proud to introduce our "B.O.S.S" Best overall Squirrel Sock. We hope you love them. Would you like to try a pair? Order today using coupon code "Squirrel" at checkout and we will take 15% off. And, that isn't the best part! One of our favorite authors Steven Rinella, who wrote "American Buffalo: In search of a lost icon" (which you really should read if you have a chance) also has done some squirrel experimentation of his own. Which lead us to believe, if you can chicken fry them, why couldn't you make jerky? So, keep an eye on this page, the first batch should be out of the oven soon. Ya'll have a great day.